Disclosure: I was sent samples from the vendor in exchange for an honest review. The views shared are mine and mine alone. If you have been to the market or stores lately then you have seen all the great Easter candy available. It seems like every year they come out with fun products that kids and adults will love. And, this the folks at Mars Wrigley Confectionery has not disappointed. My girls both smiled when they saw the DOVE® Silky Smooth Milk Chocolate Truffles Carrot Patch -- truffles wrapped in shiny foil and look like carrots in a garden. They thought it was just chocolate, but I said it was a truffle, and was a little smoother than the milk chocolate they are used to. I was hoping to deter them from wanting to try, but they couldn't wait to try it. Savannah wanted to see if it was shaped like a carrot under the foil, while Bella was hoping it would taste like carrot or have a carrot filling. There were six truffles, so we each decided that we would have two each. See we compromise when it comes to chocolate rationing in our house. :-) The really enjoyed the truffles, and were happy to report that they like truffles now. Guess I will be going to the store before Easter to pick up a DOVE® Silky Smooth Milk Chocolate Truffles Carrot Patch for each of their baskets. Ever since sampling these truffles they can't stop talking about them with family and friends. Not only were they in a cute packaging, looking like carrots, but the milk chocolate truffles were delicious, and left you wanting more. If you love truffles, then you will definitely want to pick up this seasonal chocolate from Dove before they are all gone. 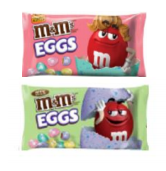 In addition to the DOVE® Silky Smooth Milk Chocolate Truffles Carrot Patch, we were also sent two M&M’S® Brand FUN SIZE® Milk Chocolate Candies Egg and Peanut Butter Egg Tins. They came with a string handle at the top making them perfect to hang on the tree branch or up in the house if you prefer indoor egg hunts. While the girls were enjoying the M&M’S® Brand FUN SIZE® Milk Chocolate Candies Egg and Peanut Butter Egg Tins, I was quick to grab up and stash the DOVE® Silky Smooth Milk Chocolate Peanut Butter Eggs for my candy stash drawer. Peanut butter and chocolate is another weakness of mine, and I couldn't wait for that night for everyone to go to bed, so that I could try one of these silky smooth peanut butter eggs. How were they? Amazing! Too bad I don't have any more. In addition to the cute Carrot Patch truffles, Dove has a cute solid milk chocolate Bunny Ears in store. While this is perfect for kids' Easter baskets, I see this delicious silky smooth Dove milk chocolate being a great gift for the Easter Bunny to leave the parents, or for kids to give as a gift to teachers, friends and relatives. It isn't huge that you if you are dieting you will feel guilty, and just the right size to satisfy anyone's sweet tooth or chocolate fix. When you eat a chocolate bunny, what is the first part you eat first? The ears right? Most of us go for the big ears, and Dove knows this so they made the DOVE® Brand Solid Milk Chocolate Bunny Ears for us in mind. This is the best part of the bunny and once you bite into the silky smooth milk chocolate you will have a chocolate experience like no other. This chocolate is truly divine. Yum! I am getting hungry just thinking about the DOVE® Brand Solid Milk Chocolate Bunny Ears and how delicious they were. I will definitely have to pick up more Dove Bunny Ears before they sell out and are no longer available after the Easter Bunny hops away. If you are a fan of candy dishes like my Nana was, then you will love the assortment of Mars Wrigley Confectionery bags available. I was sent their Starburst Jellybeans, which are made with real fruit juice. My girls love jellybeans and were excited to try these as they are also fans of Starburst candy. The original bag contains cherry, orange, strawberry, lemon, green apple and grape flavored jellybeans. We had fun taste testing each flavor. It was hard to choose a favorite, but strawberry and green apple were top on my favorites list. When we weren't grabbing a handful of jellybeans to snack on, the girls were finding ways to incorporate them in our school work -- think coloring sorting and as math counters. And, we even made some fun Easter cupcakes and used the Starburst Jellybeans as painted eggs in a basket. 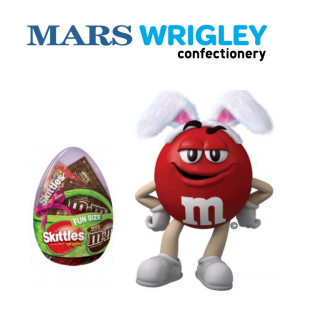 These are just a handful of the new Easter products from Mars Wrigley Confectionery, in addition to their popular seasonal products, available now in stores. "Hop into the Easter season with a delicious mix of STARBURST® Minis & Beans! A pop of flavor consumers will love to add to their Easter celebration this year!" "America’s favorite chocolate and peanut butter candies, M&M’S® are must haves for the holiday!" 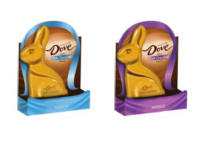 "The traditional, decadent DOVE® Milk Chocolate Solid Bunny and DOVE® Dark Chocolate Solid Bunny is a consumer favorite that makes gifting a breeze! The perfect addition to any Easter basket, or as a standalone treat to celebrate Easter." The perfect addition to any Easter basket or egg hunt! SKITTLES® Original Fun Size Eggs come in various colors for the season, in a festive reusable container which is great for decorating! "Celebrate Easter with STARBURST® in the seasonal Spring Mix edition. With their pastel colored wrappers and delicious fruity flavors, it’s the perfect complement to any candy dish!" We love the new Easter candy and the Dove ones are my personal favorite.